For anyone who has ever complained that all Canadian books are morbid and depressing, this one is for you. 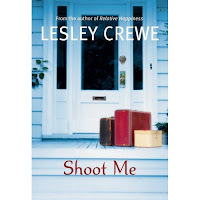 Shoot Me by Lesley Crewe is funny, fluffy fun. It’s chick lit for the older crowd. Elsie lives in an old house in Halifax, NS with her two twenty-something daughters, her soon to be ex-husband in the basement and her anti-social sister in the attic. Her other high-maintenance sister swings in and out of Elsie’s house with husband and little dog in tow. To say there’s never a dull moment would be an understatement. As if this weren’t enough, her old Aunt Hildy calls to say she’s coming home to die. Aunt Hildy has spent her life travelling the world as an archaeologist. She throws the whole family into an uproar when she tells them she has hidden treasure in the house somewhere and it’s up to them to find it. Crewe has created a quirky, crazy but lovable family. The dialogue is in honest Maritime style. However, at times both the situations and the reactions of the characters bordered on the ridiculous. For the most part, it was a fun, quick read. If you’re planning a trip down south, throw it in your bag and read it on the beach. You won’t sprain any brain cells and you might get a chuckle or two. Did you read "Relative Happiness? I read that last year. I enjoyed that too.